WASHINGTON (CNN) -- The U.S. military is segregating violent Iraqi prisoners in wooden crates that in some cases are not much bigger than the prisoners. The U.S. released three photos of crates used to hold detainees for up to 12 hours. 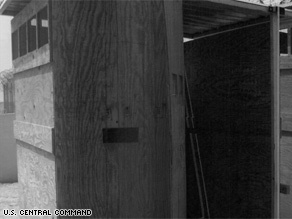 The military released photos of what it calls "segregation boxes" used in Iraq. Three grainy black-and-white photos show the rudimentary structures of wood and mesh. Some of the boxes are as small as 3 feet by 3 feet by 6 feet tall, according to military officials. There was no image released of a box that size. The photos were made public after a blogger filed a Freedom of Information Act request in 2005. The military said the boxes are humane and are checked every 15 minutes. It said detainees, who stand inside the boxes, are isolated for no more than 12 hours at a time. A prisoner has never fallen ill or died because of being held in a segregation box, Fisher said. Human rights advocates say little is known about how the military treats prisoners inside these boxes. "There are concerns that they could be used in places where the detainees are enclosed in extremely hot conditions. It is important to know whether or not detainees are provided with food," said Jennifer Daskel of Human Rights Watch. Detainees are given food and water while they are in the boxes, Fisher said. The United States' handling of detainees has been a concern since the abuses at Baghdad's Abu Ghraib prison came to light. Conditions have improved for the 20,000 detainees, but life is tough behind the wire. Hundreds are still considered to be Al Qaeda loyalists. The United States has been releasing prisoners in what Pentagon spokesman Geoff Morrell calls a "dramatic reduction" of the detainee population under U.S. control. The United States has released 10,000 prisoners and hopes to release more. In addition to thousands of Iraqis freed, 20 foreign fighters were returned to Egypt and Saudi Arabia. "We are able to capture threats to the Iraqi government and the population, detain them, rehabilitate them and, 99 times out of 100, release them," Morrell said. "We've made remarkable progress there. And I would just say it looks as though the glidepath is on continuing to reduce the population because of the success we're having within these camps." CNN's Adam Levine contributed to this report.